Usually, evolution is invisible. It happens too gradually to be seen in a snapshot; it’s only when you step back and compare where things started with where they are that significant change is apparent. That’s not what’s happening here. 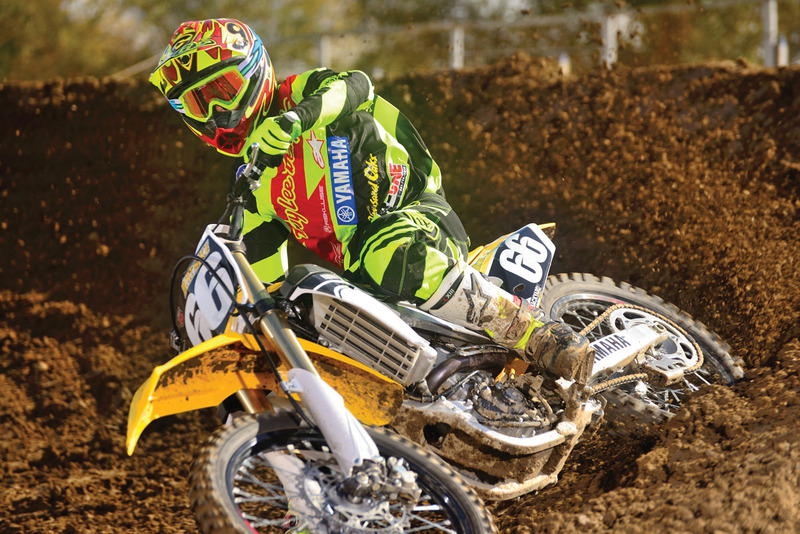 The 250 four-stroke class in motocross is experiencing a top-to-bottom transformation right in front of our eyes. In the past, most changes to the bikes, such as the introduction of fuel injection and different types of suspension, fit into the same basic profile. The first shot of the revolution was in 2014 when the Yamaha was completely redesigned. Next it was the KTM, followed by the Husqvarna. Now the Suzuki comes in with a long list of changes, making 2016 a whole new ball game. 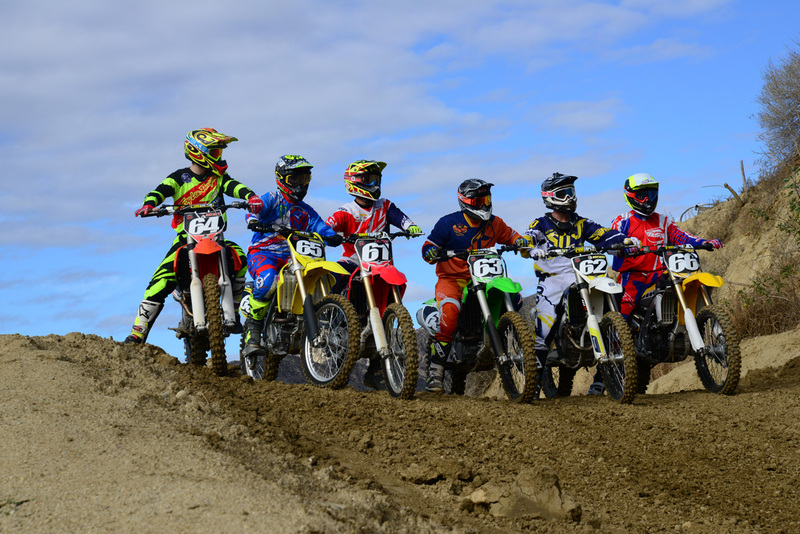 We gathered the six main contenders in the new 250F class and took them to a half-dozen different tracks with a small army of test riders. Along the way, a new picture came into focus, and it’s quite clear that the revolution isn’t over yet. With all this talk of change, it’s only fitting to start with the most familiar face in the 250 MX class. 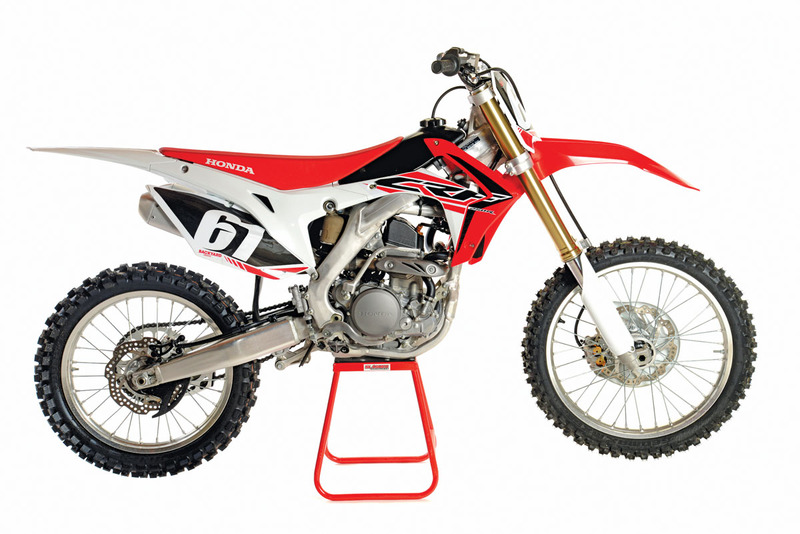 The Honda CRF250R chassis is mostly unchanged for 2016, but the motor received a little attention. It got a new piston and rod, and the compression ratio is higher. The titanium exhaust valves are new, and the cam, lifters, exhaust and airbox have all been changed. The previous year it got the first air fork in the 250 class, and now that fork is 5mm longer and has slightly different settings. The Honda already had the only stock steering damper and twin-silencer exhaust system. Now the Honda has a handlebar switch that lets you choose between three different EFI maps to tailor the power delivery. Everyone has a blast riding the Honda. It has a personality that’s universally appealing because it makes its rider feel like Superman. It accomplishes this mostly through light weight, good suspension and nimble handling. 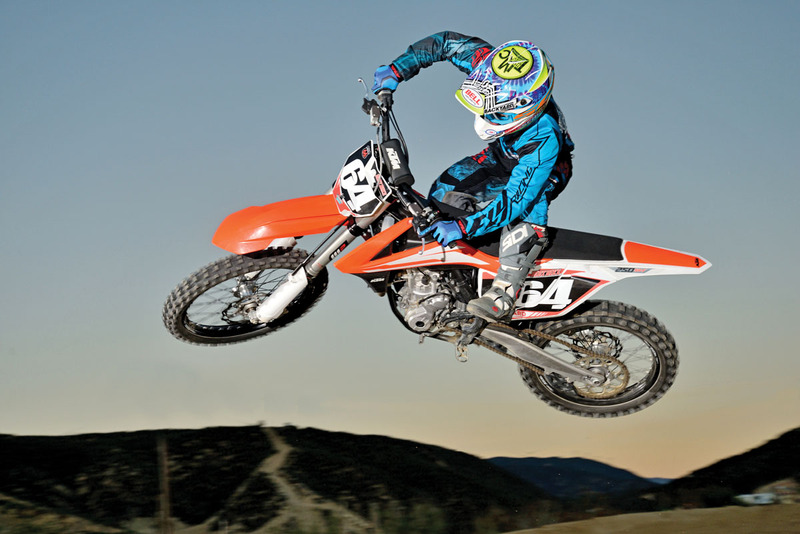 The CRF250R shares the honor of being the lightest bike in the class with two others. The KTM and Yamaha, by strange coincidence, are the exact same weight: 222 pounds without fuel. But, the Honda feels lighter than the others, and the performance of the fork is still outstanding. This is Honda’s version of the Showa Triple Air, which has three different air chambers in the left leg and the damping functions in the right leg. It sounds complicated, but as air forks go, it’s fairly easy to set up. You can usually get away with the pressure levels recommended on the sticker on the fork, and then change the compression damping to deal with different conditions. There is also some adjustment on the steering damper. Honda is the loser in the motor department. It wasn’t that long ago that it was at the top of the class, but power output has been the main objective of all the recent changes in the 250 class. Interestingly enough, the Honda looks fine on the dyno. But that doesn’t translate well to the track. Everyone else has been gaining fast, while Honda has made only slight improvements at the very bottom of the power curve. The three engine modes are a novelty but of no real use in racing. As much as we love the nimble Honda handling, it still suffers from a lack of stability, particularly on soft tracks with criss-crossing ruts. You can usually address this with clickers, but the settings might vary at each track. We love the performance of the fork, but we still aren’t completely on board with the industry-wide migration to air. It takes 10 minutes to check the three air chambers on the Honda before you can ride, while your buddies on Yamahas, Kawasakis, KTMs and Huskys have already taken off. And no list of complaints would be complete without some mention of the Honda’s 7/8-inch handlebar. Really? Honda CRF250R MSRP: $7599. Weight without fuel: 222 pounds. It’s hard to ignore the Honda’s lazy-feeling motor. It defines the bike for most test riders to a degree that no amount of agility or suspension excellence can make up for. But it has to be pointed out that the Honda is finding a new identity as the perfect first 250 for younger riders and off-roaders. It’s the favorite bike to ride when there’s no checkered flag involved. Three years after its integration into the KTM family, the Husqvarna is still the most talked-about motorcycle in the dirt. 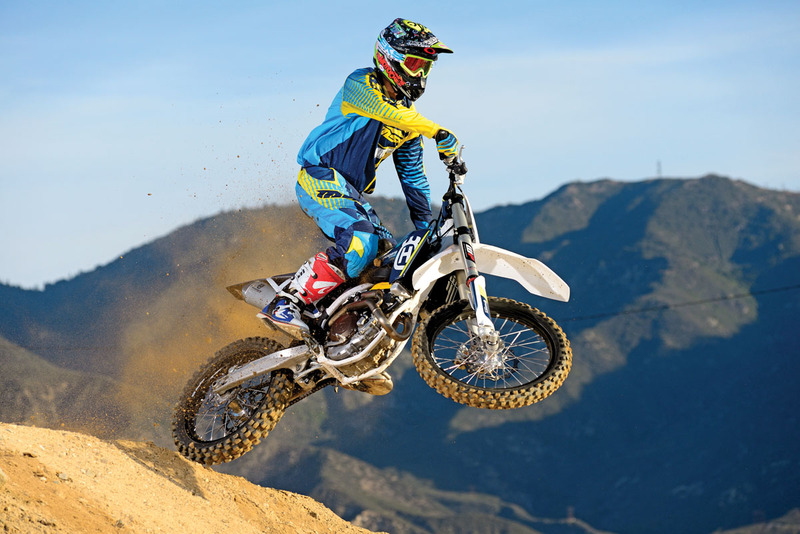 The 2016 Husky FC250 is completely new from top to bottom, and it’s sure to draw a crowd at any racetrack. 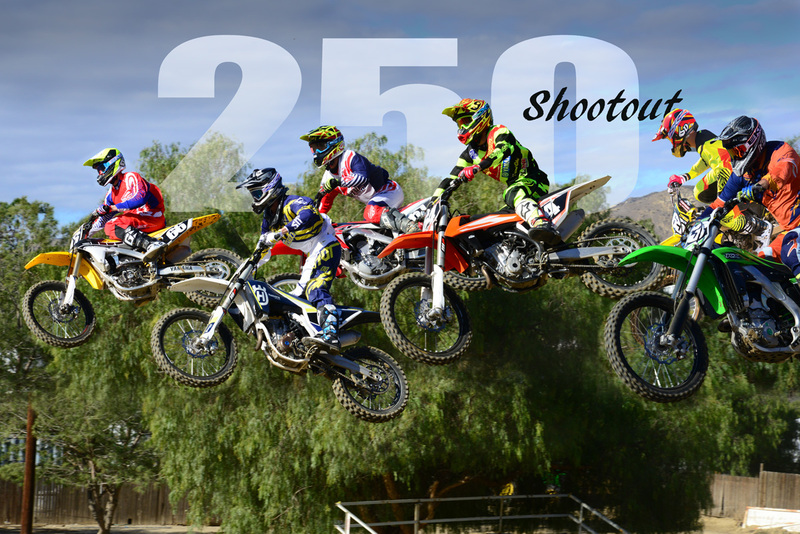 How different is it from the KTM 250SX-F? First of all, there are the obvious differences in the bodywork and the airbox. The Husky also has a Magura clutch master cylinder, a Pro Taper handlebar and Dunlop MX52 tires, but there are also hard-to-define changes in suspension and mapping. The differences are hard to pin down because they are so subtle. Let’s start off with the obvious: the Husky has electric start. Love it! On the track, the most obvious thing to love is the power. The FC250 is really fast on top. It revs and revs, giving it an extremely broad powerband. You can often hold it open a little longer than you think and get away without an extra shift. Last year’s Husky/KTM motor was a revver, too, but it seemed to take forever to get up into the happy zone. This motor is more responsive down low. You’re into the thick of the powerband much, much sooner. The Husky feels narrow and agile. At 224 pounds without fuel, it’s a couple of pounds heavier than the KTM, Honda and Yamaha, but you don’t notice any difference. Most riders liked the new Pro Taper handlebar bend and found the Husky more comfortable than the KTM. The brakes are awesome. The different EFI maps can be useful, but no one cared about the launch control feature. We went into this test expecting a repeat of the same old story: great motorcycle, harsh fork. We’ve never had a particularly good experience with the WP 4CS fork for motocross. This was only partially how it played out. There were some tracks where the Husky fork was great. It does well at speed on rough, rolling bumps, but it’s not especially good on braking bumps. The Husky is a stable bike overall until you have to brake hard on rough, choppy terrain. Then it wants to deflect, and that can mess up your whole cornering technique. Altering the compression damping doesn’t change anything at low speed. We can’t honestly say that anything about the motor is a weak point, but it’s so powerful on top that the bottom is weak by comparison. The clutch is a little stiff, the seat is a little hard and the subframe is a little wide. 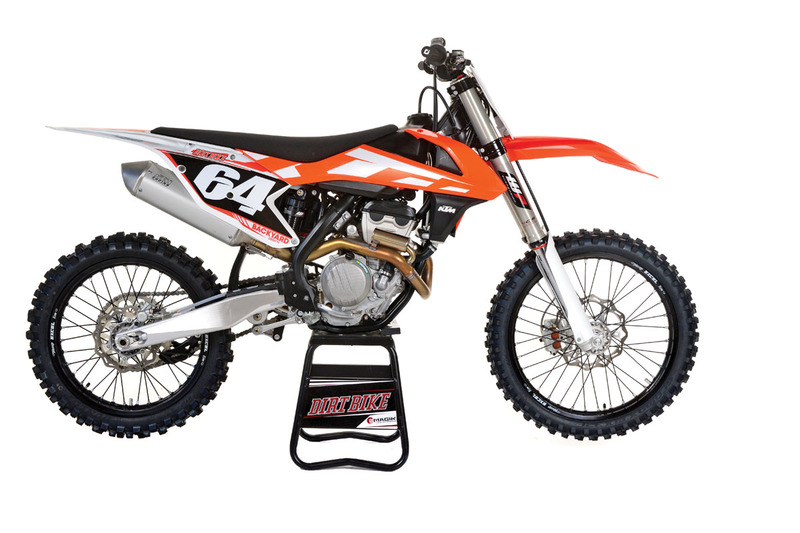 The Husky’s Dunlop MX52 tires are okay but not as good as the KTM’s MX32s. 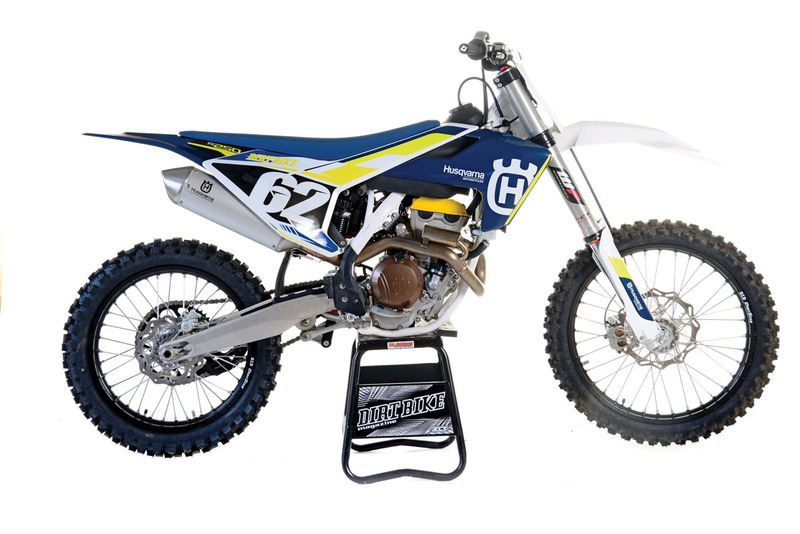 Husqvarna FC250 MSRP: $8499. Weight without fuel: 224 pounds. Of all the Husqvarnas that we have tested, the FC250 is the most KTM-like. There are certainly differences between the FC250 and the 250SX-F, but in outright performance, they are nearly twins. Having said that, this is a truly great motorcycle. It’s incredibly fast, light and well built. It’s 100 percent better than the 2015 FC250 that it replaces. This year’s bike has the same strengths and weaknesses, but the strengths are stronger and the weaknesses are fading into footnotes. Kawasaki has its priorities. 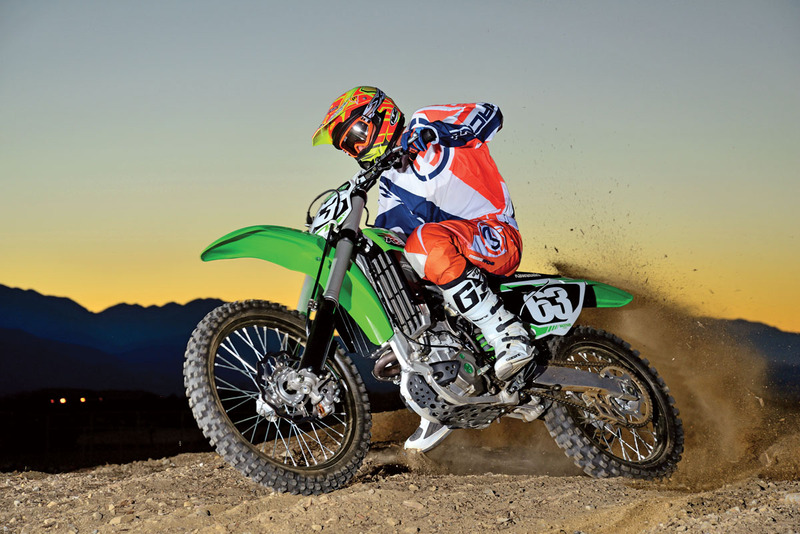 For 2016, the new KX450F was the beneficiary of an all-out effort, while the KX250F was virtually untouched. That’s fine with us, because the 250 Kawasaki was a little ahead of the curve and still holds the record as the winningest bike in the pro ranks. The KX’s most notable feature is the dual-injector system, which uses one injector in the throttle body and another one in the air boot. The injectors take turns supplying the motor at different rpm and are both operating at full cry around 7000 rpm. The Kawasaki also uses the Showa SFF fork, which has a single spring on the right side and damping functions in the left side. For 2016, the biggest news is that Kawasaki now offers a handheld electronic mapping tool, as well as three couplers for altering the powerband. If any bike offers a seamless package, it’s the Kawasaki. The bike is good at everything. The motor was way out in front three years ago and is still holding up well in the face of newer hardware from other manufacturers. It has the second best low-end power and the best low-end throttle response of the bunch. With a little clutch action, the engine free-revs very quickly, which means you can summon power, even if you’re in the wrong gear. The simplicity of the Kawasaki’s fork is a huge plus. It performs very well, and you don’t have to mess with it. There’s no air pressure to worry about, and it’s the only bike that offers adjustable preload. And on the subject of adjustability, you can move the footpegs as well as the handlebar mount to suit your taste. You just can’t sit still this long in the 250 class. In peak power the Kawasaki is a step behind the KTM and Husky, and in low end, it can’t match the Yamaha. On the scale, the Kawasaki weighs 229 pounds without fuel, making it the heaviest of the group. We need to point out that no riders complained about the weight, but no one praised the bike’s handling or agility, either. The once-great KX250 is now disappointingly average in overall handling. Some riders complained that it’s not especially stable at speed. And, the KX is noisy. Not only is the exhaust loud, but the motor pops and makes unhappy sounds at high rpm. Launch control is a little silly on a 250F. The stickers fall off quickly. The clutch needs stiffer springs, and the handlebar is undersized. 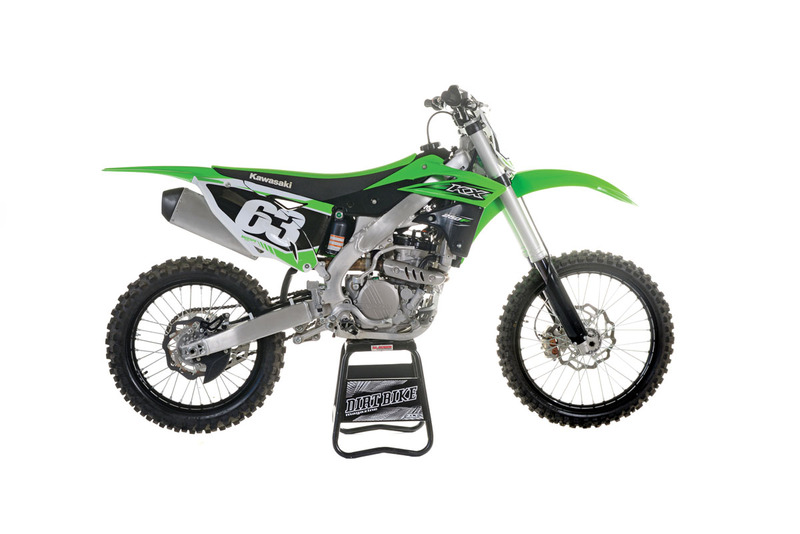 Kawasaki KX250F MSRP: $7599. Weight without fuel: 229 pounds. Kawasaki has retreated to the middle of the pack. The Kawasaki remains a great motorcycle, just not as great as it once was. We can still say that Kawasaki riders will have no meaningful disadvantage in 2016, but that’s not like having the green secret weapon of the past. It seems like KTM has an unlimited capacity to produce new motors as the need arises. The 250SX-F needed a new motor in early 2015 and got it. In fact, everything about the bike was new at the mid-year release of the 2015 1/2 Factory Edition. The 2016 model is sort of a second-year version of that. It still matches the broad, general description of the original 2015 model. It still revs to well over 14,000 rpm. It still has electric-start, and it still has a steel frame with WP 4CS suspension. There’s a handlebar-mounted switch that lets you choose EFI maps, and the same switch doubles as the activator for the launch control. The main differences between this and the Husky are the bodywork, subframe and airbox. The KTM has a Neken handlebar, a Brembo clutch master cylinder, Dunlop MX32 tires and ODI lock-on grips. The motor is absolutely phenomenal. It makes decent low-end power, but in the middle and on top it’s a raging bull, at least by 250 standards. It’s also quieter than the Kawasaki, Yamaha and maybe the Suzuki. Is it stronger than the Husky? Maybe, maybe not. The only reason it might be is because of the different airbox, but most riders can’t say if that makes any difference. The KTM is a much better-handling bike than it used to be. It’s one of the lightest (despite having electric start), and it feels like the smallest bike in the shootout. That doesn’t mean it’s cramped, just that it feels narrow and somewhat short. Once upon a time riders of Japanese bikes could never quite feel at home on the KTM. Those days are gone. Anyone can get on the bike and feel comfortable. It has great brakes; a consistent, if-somewhat-stiff hydraulic clutch; and well-spaced gear ratios. The bike revs so high that you don’t have to shift that often. If you know your KTM history, you know this is the part of the test where we talk about the fork. The WP 4CS is harsh in some situations. It doesn’t like sharp-edged impacts, and the front end deflects on braking bumps. The compression clicker on the left fork cap isn’t very effective. Having said that, the KTM suspension is improved for 2016. Some riders praised it on rough tracks with rolling bumps. But, the fork remains the biggest flaw in an otherwise glimmering package. Several riders said the KTM felt stiffer than the Husky, but there are no reported technical differences between the two forks. KTM 250SX-F MSRP: $8399. Weight without fuel: 222 pounds. We love the new KTM. The fact that the new motor has more top end, more bottom end and is lighter than the old one is amazing. The fact that it has electric start and weighs no more than the other bikes is even more amazing. The KTM is expensive because it gives you so much. Just save a little cash for suspension work. Suzuki knew it had to make changes to the RM-Z250. It was once our favorite 250 MX bike, but over time it stood still while others passed it by. Finally, a new RM-Z250 has arrived with a very long list of changes, but you would never know from the bike’s appearance. In fact, we had to get out our calipers and micrometers to double-check the technical data. Sure enough, the Suzuki motor has over 80 changes, but most are very slight. The piston, valves, cams, crank and ignition rotor are new, as well as a number of parts in the kickstarter and shifting mechanisms. All very minor stuff. Even the frame is different in a very small way. The most significant changes are to the suspension and the ignition/EFI system. The fork is the new KYB PSF2 air fork. The shock is also new, and the engine now has Suzuki’s version of launch control. 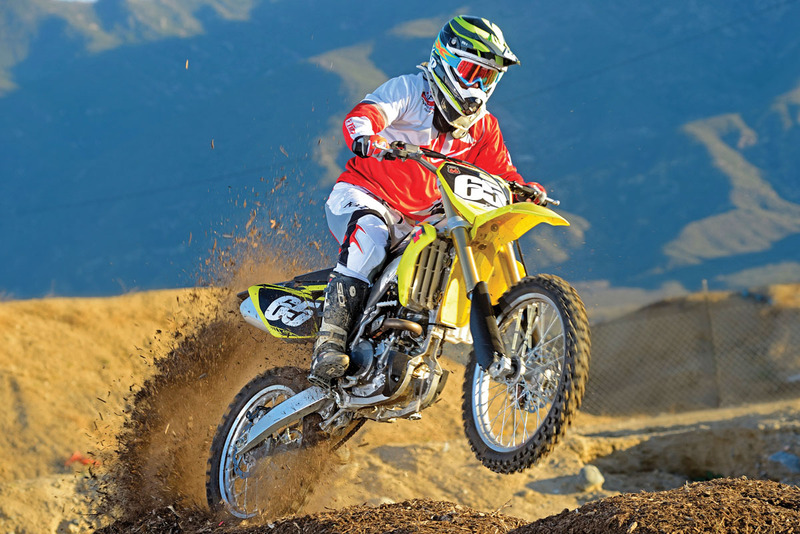 Handling has always been the RM-Z250’s big advantage, and this model is no different. It turns. You can go outside, inside or any combination of the two, and the RM-Z will do as it’s told without complaint. It scores well at the other end of the speed spectrum too. The RM-Z is stable at full cry over rough terrain. This is one of those bikes that makes you feel like you’re a better rider than you really are. Suzuki is very good at details. The bike is comfortable. The clutch has a light pull. The Renthal handlebar is excellent, and shifting and starting are good. Up front, there’s a new front brake caliper that offers somewhat improved performance. We’re disappointed that with all these changes Suzuki hasn’t found more power. Last year, the bike’s biggest shortcoming was the motor, and the new motor doesn’t feel much different. It free-revs somewhat quicker, but overall, it’s no match for the KTM-powered bikes, the Yamaha or even the Kawasaki. We’re also on the fence about the KYB fork. We know we should like it, but we never found settings that made us feel warm and fuzzy. The front tends to climb out of berms in some situations. The fork has six different clickers and two air chambers. The rear shock has four different clickers and preload. Do the math. There are 199,999,999,988 combinations we haven’t tried yet. Check back with us in 2030. Suzuki RM-Z250 MSRP: $7699. Weight without fuel: 226 pounds. If it’s going to be four more years before we get another significant change for the RM-Z, Suzuki riders are going to be doing hard time. The RM-Z is a bike that we want to like, and it is still good where it’s good. But, we were hoping for more. If a corporate entity can have a smug, self-contented smile, Yamaha must have a huge grin on its face right now. The YZ250F is the best-selling 250cc MX bike. 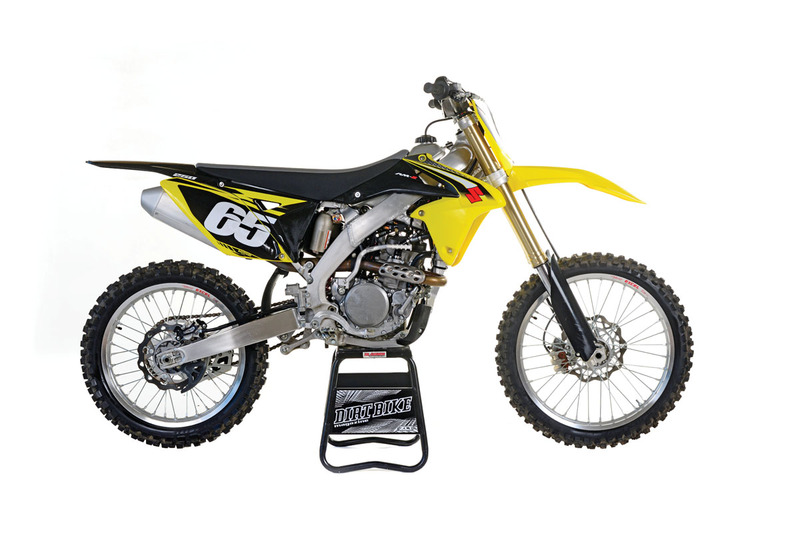 It won the AMA 250 National Motocross Championship. Again. And, the YZ250F has won the last two Dirt Bike 250F shootouts. Why wouldn’t you smile? The 2016 YZ250F is back with a short list of changes aimed at keeping it on top of its game. It has a new two-ring piston, a rebalanced crank and counterbalancer, reworked oil jets and new ECU settings. The bike still has the reverse-engine layout to centralize mass, the airbox in front of the seat and an old-school KYB fork with a spring in each leg. For 2016 there’s a yellow 60th Anniversary Edition (shown here) that sells for $100 more than the standard blue model. What a great motor. The Yamaha has a ton of power right when you first open the throttle. This isn’t like the original 250 four-stroke motocross bikes that took forever to get going. The Yamaha is crisp and immediate. The YZ is no slouch on top, either, although the Husky and KTM take the award for having more peak power. In roll-on drag races, the Yamaha will generally get the jump and not let go. On top, the 2016 YZ has a much less abrupt sign-off than its predecessor. In the past, the Yamaha always got the trophy for best overall suspension, and that’s probably still true, but it has company. The Honda, in particular, gets rave reviews. But Yamaha is using an old-fashioned fork that requires no maintenance. Once you set your clickers and shock preload, you never have to look at them again. The Pro Taper handlebar is excellent and can fit everyone with its four positions. The new 270mm front rotor is a big improvement, and the air filter stays clean because of its location on top. Despite being one of the three lightest bikes in the shootout—at 222 pounds without fuel—the Yamaha feels bulky. It isn’t especially agile in turns and requires the most aggressive riding style. The Yamaha tends to corner very quickly, because it likes a lot of throttle to make the front end stick and bring the rear end around. Riders often complain that the YZ is noisy because of a loudish exhaust bark and a sucking sound from the air filter. 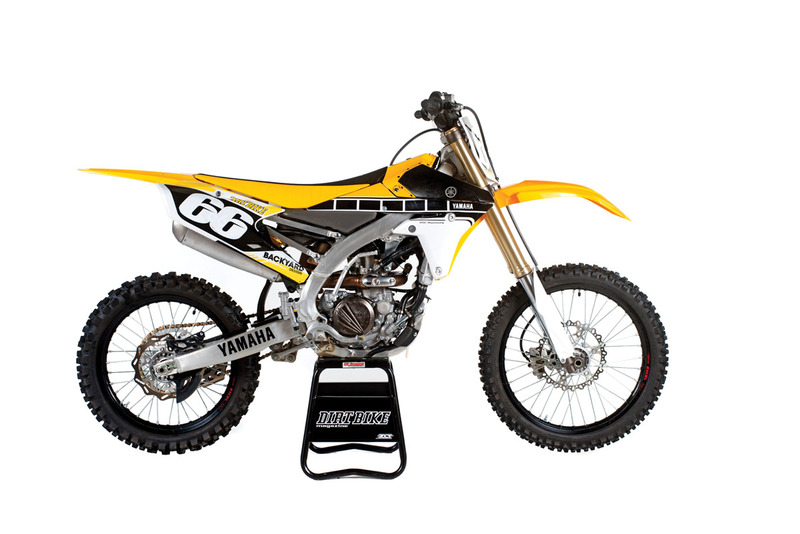 Yamaha YZ250F MSRP: $7590 (standard edition). Weight without fuel: 222 pounds. Yamaha has a right to be pleased with itself. This version of the YZ250F is now in its third year, and it’s better than ever. It has three parts of the puzzle: great power, great suspension and light weight. How can it go wrong? We’ve had shootouts in the past where two bikes were in a dead heat for first place. We always worked out our differences and picked one winner. This year it was a three-way battle. The Yamaha, KTM and Husky all had passionate defenders in the shootout debate. Making it more difficult was the fact that the KTM and Husky are so similar. Nonetheless, once we talked it out, we came up with a winner that everyone could accept. 1.) Yamaha YZ250F. The YZ wins again, but it’s no longer the lightest, most powerful and best suspended. It’s very close (or tied) for top honors in all those categories, and when you’re that good across the board, there aren’t many test riders who will put up a fight if we call the Yamaha the best 250 of 2016. 2.) KTM 250SX-F. Why would we choose the KTM over the Husky when they are nearly identical? In truth, most riders preferred our KTM test bike for the slightest reasons; it’s narrower and lighter, at least according to the scale. The KTM has awesome top-end power and might have the slightest edge over the Husky. 3.) Husqvarna FC250. We hate it when riders talk about the Husky as if it’s just another KTM. Even in this case, when the two bikes are more alike than any other pair in the combined line-ups, the Husky has such a distinctive heritage and identity, you’re missing the point if you concentrate on shared part numbers. The Husky is a great machine that holds an emotional grip on many riders. 4.) Kawasaki KX250F. Going into this shootout we assumed that the unchanged Kawasaki was going to be the loser, but that’s not how it played out. The KX might be unchanged, but it’s still competitive and had surprising support at the debate table. It wouldn’t take much to bring the KX250 back to the front. 5.) Honda CRF250R. The strange part about the Honda is that most riders described it as the most fun to ride, yet it finished in fifth because it feels draggy and not particularly fast. No other reason. It makes us question the priorities of the 250 class. When did fun go out of style? 6.) Suzuki RM-Z250. Don’t get us wrong; we still love the Suzuki for the way it makes us feel. When you ride the RM-Z, you start believing that you just figured out how to turn after years of not getting it right. That’s why we’re so disappointed that Suzuki wasn’t more effective in its attempt to bring the bike up to date.